There are a variety of tools you can use to help train your canine but dog shock collars (bark collars or e-collars) are an often-overlooked, and possibly best option for owners. 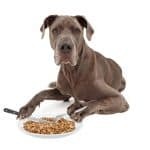 Below, we’ll discuss some of the most important criteria you should consider when shopping for a dog shock collar and the applications in which they excel. Then, we’ll recommend seven of the best shock collars for large dogs on the market. Shock collars for dogs provide the ability to manipulate your dog’s behavior by delivering very small electric pulses designed to get your dog’s attention or issue a correction. They do not cause significant pain or discomfort when used properly, and they are often quite effective. Dog shock collars have been used to train dogs since the 1960s. Originally developed for use with hunting dogs, these early collars were not terribly humane; they delivered very strong shocks, which often resulted in frightened and stressed canines. Fortunately, times have changed, and owners have begun treating their dogs better in subsequent years. This led manufacturers to develop gentler shock collars, which deliver much milder shocks. Such dog collars are much more effective for training purposes and work well when used properly. Most modern shock collars for dogs are multi-function devices, which can also emit audible tones or vibrate when triggered. 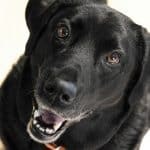 These types of stimuli are often just as effective for training, and they alleviate the need to shock your dog at all. In fact, most modern manufacturers and trainers recommend only using the shock function in emergency situations. For example, you may use the beep or vibration mode to train your dog to walk in the heel position, stop jumping on visitors or refrain from nuisance barking. But, if your dog begins running toward the street or in the direction of another dog, you can deliver a shock to stop him in his tracks. Note that modern dog shock collars come in two basic versions. Some, which we’ll cover today, only deliver a stimulus when the owner presses a button. Meanwhile, others (which we’ll cover in another article) are designed to sense nuisance barking and deliver an automatic correction. While those in the former category are useful for a wide variety of training purposes, those in the latter category are only helpful for controlling nuisance barking – they won’t help you teach your dog to walk on a leash properly, for example. 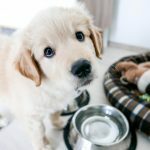 Which Dog Shock Collar is the Best? There are a number of shock collars for large dogs on the market, but some work much better than others do. You can distinguish the good from the bad in part by considering the features provided by different models. Most products will deliver a mild electric shock, but the best electric dog collars also allow you to trigger an audible tone or cause the collar to vibrate. It is always preferable to use the mildest corrections possible, so always start with the mildest settings and slowly increase the intensity as necessary. Note that many dog shock collars are marketed as having four different types of corrections: an electric shock, vibration, an audible tone and a blinking light. However, a blinking light is unlikely to serve as a useful correction for your dog. However, this blinking light can still provide value, as it will allow you to easily see your dog after dark. You always want to use the gentlest possible shock to achieve the desired result, so be sure to select a shock collar that allows you to adjust the intensity of the correction. This is a fairly standard feature in most modern collars, but always check to ensure this capability is included before breaking out your credit card. Most high-quality, multi-function shock collars will also allow you to adjust the strength of the vibration delivered too. Audible tones are rarely adjustable on dog shock collars, but that isn’t a big problem – most emit a tone that is clearly audible, yet not loud enough to be distressing to your dog. You don’t want to be forced to remove your dog’s shock collar when it is raining outside, so you should always opt for models with water-resistant receivers. And, if you are interested in training your dog while swimming (such as is often necessary for hunting dogs), you’ll want a fully waterproof model. Note that the transmitters included with most dog shock collars are only water-resistant, so you’ll want to take care when using them in the rain or around the pool. Most training will take place at fairly close range. However, you may need to issue corrections when your dog is at a distance, such as while teaching him to retrieve or while you are hanging out at the local dog park. Modern dog shock collars usually work at ranges of about 800 to 1,000 feet, which is adequate for most training circumstances. Do note that manufacturers often appear to exaggerate the range of their shock collars slightly, so if you have a concrete distance requirement, you’ll want to select one with a range that exceeds your requirements by 10% to 20%. Training collars must be fairly light, so they don’t restrict your dog’s mobility. Accordingly, the batteries they use must be relatively small, which means they won’t hold a charge for very long (perhaps a week). Unless you want to purchase new batteries 50 times a year, you’ll want to select an e-collar that uses rechargeable batteries. Understand that both the receiver and the transmitter require batteries, so you’ll need to recharge both components regularly. Some of the best dog shock collars come with charging-cable splitters so that you can charge both components at the same time. Like any other type of collar, you’ll want to ensure that you buy a dog shock collar that fits your canine comfortably. This will help prevent chafing and ensure that the shock collar works properly. Most shock collars for large dogs feature a pair of metal electrodes that protrude from the receiver and are designed to contact your dog’s neck – this is how the shock is delivered. To ensure proper function, you must be sure to pick a collar that fits your dog’s neck well, so be sure to measure your dog before making your purchase. The buttons on some shock collar transmitters are very easy to press, which can lead to inadvertent corrections. This is especially true when you are carrying the transmitter in your pocket. An on-off switch helps to prevent this type of thing from happening, but unfortunately, on-off switches are relatively rare in dog shock collars. If you are aware of a good dog shock collar that includes an on-off switch, let us know about it in the comments – we may include it in future reviews. 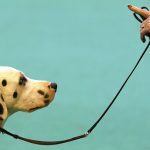 Many dogs pull on the leash during walks or lunge at people and pets that walk by. By using one of these collars in conjunction with a standard leash, you can help stop these types of behaviors. Just give your dog the “heel” command and walk as you normally would. When your dog starts pulling you around or moving towards others, tell him “No!” and trigger the collar to beep or vibrate. This should usually cause your dog to stop the behavior, although you may have to use the shock function the first few times. Many dogs become excited when visitors come over and greet them by jumping up and putting their front paws on the visitor’s chest. You can help end this behavior by making your dog wear the collar whenever you anticipate visitors, and then triggering the beep or vibration when your dog exhibits the behavior. You may need to use the shock function at the outset, but as always, move to the gentler corrections as soon as you possibly can. Even though traditional dog shock collars are not explicitly designed to stop nuisance barking, they can be used to control this problem. 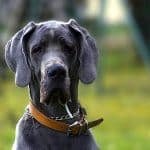 You’ll have to keep the bark collar on your dog most of the time to control nuisance barking, but with plenty of repetition, you’ll likely find that your dog stops barking on his own. As when you are trying to prevent any other type of problematic behavior, you’ll want to use the gentlest correction possible to achieve the desired result. While you probably don’t want to use the shock function to train your dog to perform retrieving or agility tasks, you can use the audible beep or vibration as a way of communicating with your pet at a distance. Just be sure to instill a positive association between the beeping sound or the vibration, so that your dog does not think he is being reprimanded when you trigger these signals. As always, be sure to provide plenty of praise and affection whenever your dog reacts properly to the correction (and always have some good training treats on hand), and never use a shock collar to punish your dog. If you decide to purchase an e-collar, you’ll want to stick with one of the best units available. This way, you can be sure they’ll deliver the right type of correction for your dog, work safely and aid in the training process. About: The PESTON Dog Training Collar is a multi-function tool that helps owners train their dog quickly and effectively. The PESTON Dog Collar can provide three different types of correction signals: an audible tone, vibration and an electric discharge. A rechargeable unit, the PESTON Dog Training Collar has a 2,000-foot range and is designed to work through walls, so you can stop your dog from barking when he’s in the next room. User Reviews: Most owners were incredibly pleased with the PESTON Dog Training Collar. Several owners reported that their training sessions have become more productive after using the bark collar, and few have even had to use the shock feature – they’ve simply used the tone and vibrate modes to train their canine. Bottom Line: The PESTON Dog Training Collar has all of the features you’d want in a dog shock collar and has received great reviews from most owners who’ve tried it. The 2,000-foot range is adequate for most owners, and the waterproof nature of the collar is a nice bonus feature. Given the reasonable price tag and 1-year replacement warranty, this dog shock collar is a great option for most owners. About: The PetTech Remote-Controlled Dog Shock Collar is a four-function training device, which issues corrections via a light, audible tone, vibration or static discharge. The remote control’s large LCD screen makes the display easy to see, and the receiver is water-resistant. User Reviews: The majority of owners who tried the PetTech Remote-Controlled Dog Shock Collar were quite happy with it and reported that it helped train their dog very quickly. Most praised the quality of the tool, and several raved about PetTech’s customer service department, which helped to address technical difficulties and provide training advice via email. However, a few owners complained that the bark collar did not work at extended ranges, and a few others reported that the dog collar stopped working after a few months of use. Bottom Line: The PetTech Remote-Controlled Dog Shock Collar has all of the basic features you’d want in a good dog shock collar, and most owners were happy with the product. It is not the most affordable option on the market, but it is still priced very reasonably and represents a good value. About: The Petronics Rechargeable Shock Training Collar provides dog owners with four different ways to correct their dog. The unit can flash a blinking light, emit an audible tone, vibrate or deliver a mild static shock at the push of a button. The remote control can be used with one or two collars, and it has a 330-yard range. User Reviews: The Petronics Rechargeable Shock Collar received pretty good reviews from most owners. Many reported that it was a fantastic tool for training their dog and that they were very satisfied with the product. However, a not-insignificant number of owners experienced problems with the dog collar and reported that it stopped working in a short period of time. Bottom Line: The Petronics Rechargeable Shock Training Collar is probably one of the best dog training collars for budget-limited owners, and it appears to work reasonably well for most dogs. The 5-year warranty helps to offset concerns about the product’s quality, and it provides all of the functionality that many higher-priced dog shock collars do. About: The Petrainer Dog Shock Collar is a very popular training collar, which has proven effective for most owners who’ve tried it. 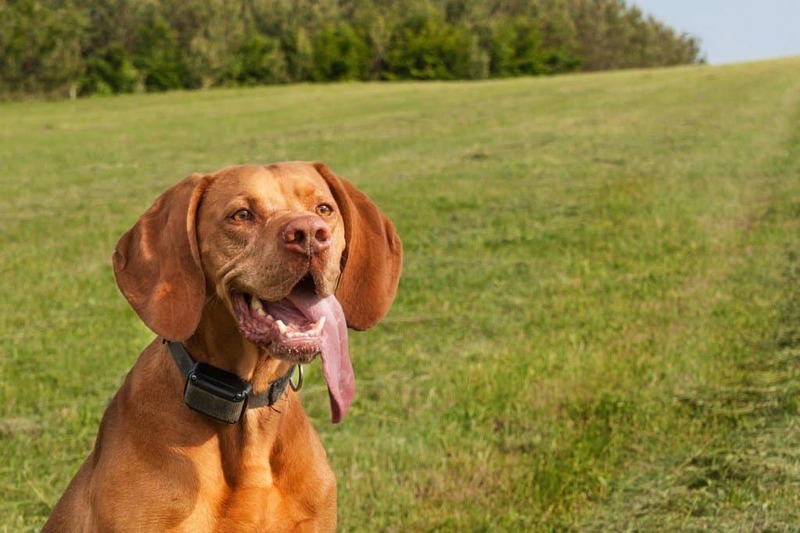 The bark collar delivers three different types of correction (audible tone, vibration and electric shock), and it works at distances of up to 330 yards. User Reviews: The vast majority of dog owners who tried the Petrainer Dog Shock Collar were very happy with the product. Most noted that it was very easy to use and provided effective control for altering their dog’s behavior. A few owners were unhappy with the included collar, but you can use your own dog collar with the unit if you prefer – just remove the receiver and slide it onto the collar of your choice. Bottom Line: The Petrainer Dog Shock Collar is affordably priced, well-built and easy to use. It received extensive positive reviews, ranking it highly amongst the other dog shock collars in our review and it is backed by a 3-year warranty. Accordingly, it is easily one of the best options in this product category and highly recommended. About: The iPets Waterproof & Rechargeable Dog Shock Collar is a simple and straightforward training tool that is easy for owners to use and effective for training dogs. It offers three different types of correction (vibration, audible tone and static discharge), each of which is adjustable. It works at distances of up to 900 feet. User Reviews: Many owners were very happy with the iPets Waterproof & Rechargeable Dog Shock Collar and reported that it was a valuable tool for training. However, a number of owners reported problems with the unit – particularly after exposing the bark collar to water. It does, however, appear to be very easy to use, and it has an intuitive interface. Bottom Line: The iPets Waterproof & Rechargeable Dog Shock Collar deserves consideration from most owners, especially those who value simplicity of design. However, the bark collar is a little more expensive than many of the other available options, which is disappointing, given that it does not appear to be especially reliable or durable. About: The SportDOG 425 Remote Trainer is a high-end electric training collar for owners that is perfect for large dogs. A very flexible training aid, the SportDOG 425 can deliver quick or continuous stimulation, and it can also provide vibrating or audible signals to help control your dog. There weren’t many complaints, although a very small number of owners reported difficulty using this with small dogs (but this shouldn’t be a problem for Canine Weekly readers). Bottom Line: You’ll pay a little more for the SportDOG 425 than you will many other electric training collars, but given the features it provides and the numerous positive user reviews it has received, you’ll likely find that it was worth paying a premium. It provides all of the basic functions and features most owners would want, and it is a well-made, durable and waterproof unit. There’s not much else you could ask for in a shock collar for large dogs. About: The Educator Remote Training Collar utilizes slightly different technology than most other shock collars, as it delivers a “tapping” sensation rather than a the “sharp” correction most other shock training collars do. It also has a number of other attractive features, such as an included user-controlled LED light on the collar. User Reviews: Most users rave about the Educator Remote Training Collar and describe it in glowing terms. Several reported that it helped to train dogs who’d resisted all other training methods. A few did complain that it was necessary to charge the battery every day, but that’s a relatively minor problem. Bottom Line: If you are looking for a gentle, yet effective training aid for your large dog, you should definitely consider the Educator Remote Training Collar. The unusual sensation produced by the collar is likely the most intriguing aspect of the collar, but it’s ergonomic transmitter, lightweight collar, and impressive range are also pretty attractive features. Do you use a shock collar to train your dog? We’d love to hear about your experiences. Let us know what model you use and your favorite (and least favorite) aspects of the product. Has it helped you to accelerate the training process or better communicate with your canine?